The heart motif can be used in many different creative ways on Valentine's Day. Here are several ideas for how you can create your own hearts on the day. I’ve said it before, and I'll say it again - if there is an occasion to celebrate I'm going to celebrate it! I don’t need a reason to invite friends over for a fabulous meal, or an excuse to go shopping for my loved one for that something special, nor does anybody! If you want to show someone you love them - do it! Now and on any day of the year! So when Valentines Day comes along, get creative and do something different. You don’t have to spend an enormous amount on the perfect gift (but I will never say no!) because I have plenty of ideas on how to show the special people in your life that you love them. It's simple and all revolves around the humble love heart. We all crave a little sweetness at times, and for Valentine’s Day you have the perfect excuse to create something delicious both to look at and eat. Something as simple as a heart-shaped display of food can look so stunning. Beautiful Cherries, when in season are such a gorgeous fruit and such a pretty colour. Arranging them in a heart is a sweet dessert idea, or even an afternoon school snack for the kids on Valentine’s Day. Heart ice-creams are the perfect treat on a hot Australian Valentine's Day. These cute heart-shaped sorbets are made by Popstic Ice Cream Melbourne. They taste just as delicious as they look! Another fun dessert idea is a tray of lollies. Keeping to one colour palette, pink and red being perfect for this romantic day, and using an assortment of sweet treats. I chose musks, marshmallows, pink freckles, chocolate hearts and jelly lips and arranged them in little paper cupcake holders. A cute and super sweet idea. I love this idea! It’s so simple to pull together, but doing this for the ones you love is very special. All you need to do is buy a cute pad of post-its, mine being from Kikki K. I filled the pad with a collection of love notes, sweet words and little quotes. You can fill them with whatever words you like and create any shape you like, but for this Valentine’s Day, a heart shape is perfect! A collection of pink and red roses cut at the stem and arranged in a heart shape could not be more romantic! 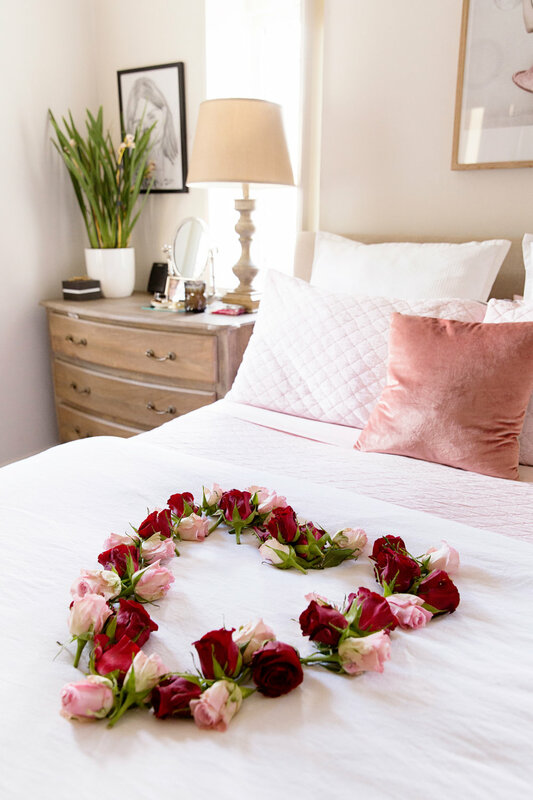 Whether it be arranged on a bed, the dining table or even a cushion on the lounge room floor, this is a sweet gesture with the added benefit a gorgeous rose smell.